In 2014, the City of Hayward claimed contract negotiations had broken down, and unilaterally imposed a contract on its employees. 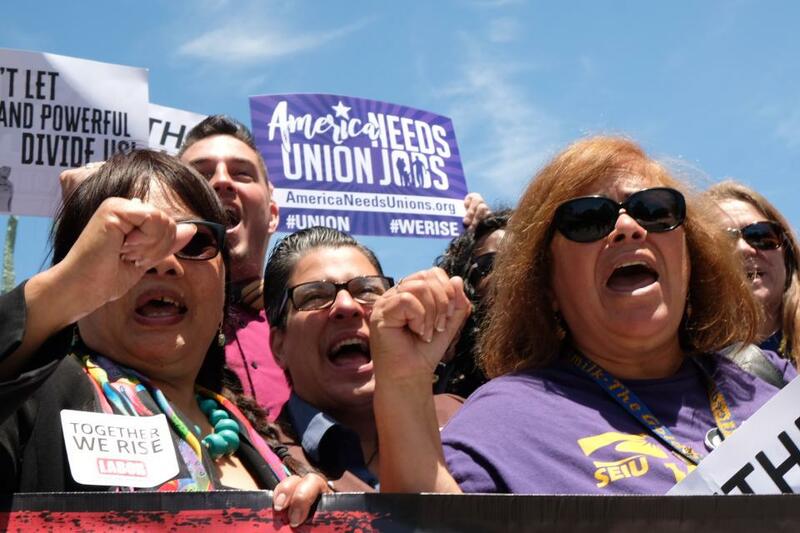 Workers united in SEIU 1021 never stopped fighting this unfair, one-way decision, and took the case all the way to PERB, the Public Employment Relations Board. 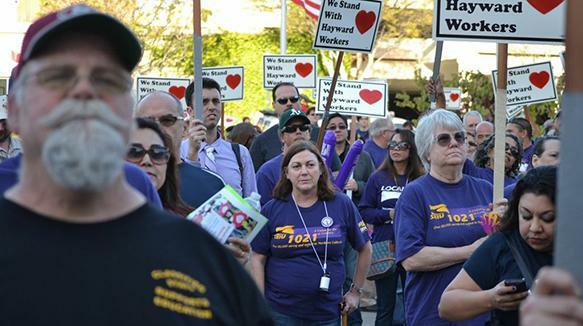 Because of this ongoing, determined effort, the City has settled, agreeing to pay back, with interest, all SEIU 1021 employees of the City of Hayward who lost wages and benefits during the contract imposition period (from February 2, 2014 to June 30, 2015). 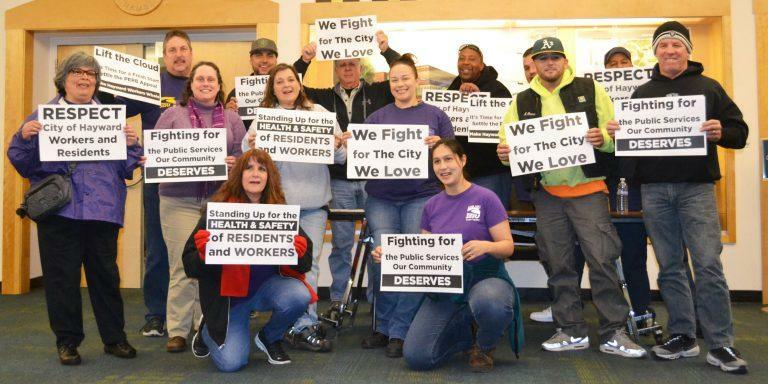 After several months of contract negotiations and high-visibility actions, Hayward workers have approved a new contract. 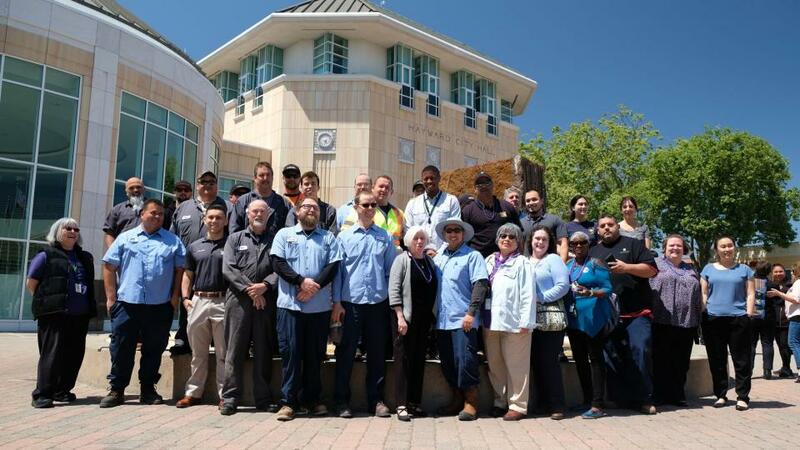 The three-year agreement includes raises, in addition to other gains that would help workers continue to live and work in Hayward. “By standing together, we let the City know that everyone who works for the City of Hayward deserves respect and a fair contract. 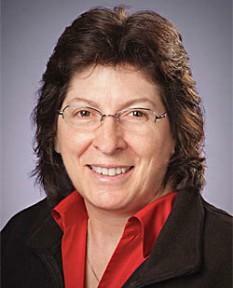 We demanded it, and we got it,” said Clerical Chapter Acting President Felicia Sandoval. Today, the Hayward City Council is holding a hearing to impose their own terms and conditions on Hayward’s city workers. The Alameda County Democratic Party, the Alameda Central Labor Council, members of the community and their own employees — all have urged them not to do so. Hundreds of Hayward workers, their neighbors and community allies, marched on Hayward City Hall on Friday, March 14th, against the sitting politicians who have imposed unfair wage cuts that worsen economic inequality. 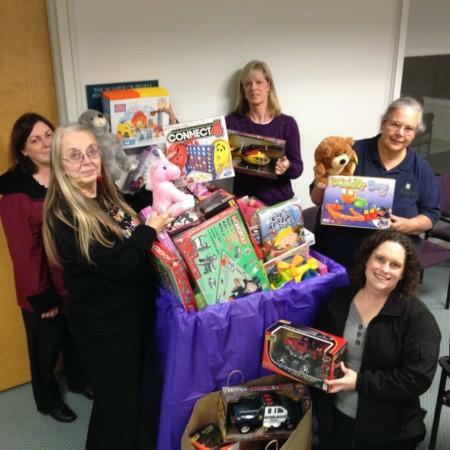 HAYWARD, CA — City Workers who have lost 17% of their incomes due to imposition earlier this year donated 280 toys at Hayward’s City Council meeting Tuesday night — one toy on behalf of each SEIU 1021 member that works for the city. The toys are being donated in the name of Doris Rodriquez, a former Hayward City Councilmember, who passed away this week. “Doris worked tirelessly on behalf of working families and improving the lives of children of Hayward,” said Gil Hesia, President of SEIU Local 1021’s Maintenance Chapter for Hayward. 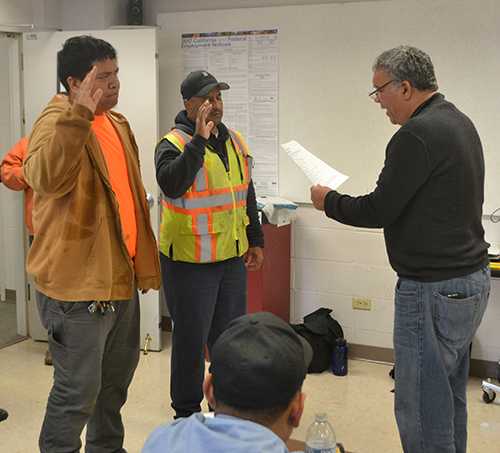 On Monday, January 22, the City of Hayward chapter of SEIU 1021 welcomed two new officers to the Maintenance unit: President Gilbert Hesia, a Senior Utility Leader, and Alvin Ahquin, an Equipment Operator. Both spoke to members at the lunchtime meeting, stressing the importance of solidarity and supporting the Bargaining Team as contract negotiations begin with the City. As we prepare to bargain for a good contract, it is very important for every member to make sure their contact information is up to date. This evening City of Hayward workers spoke before City Council to demand that Hayward Administrators restore cuts made to workers’ pay and benefits. Hayward Administrators are refusing to restore the cuts that were made three years ago, even after a judge found their actions to be illegal.